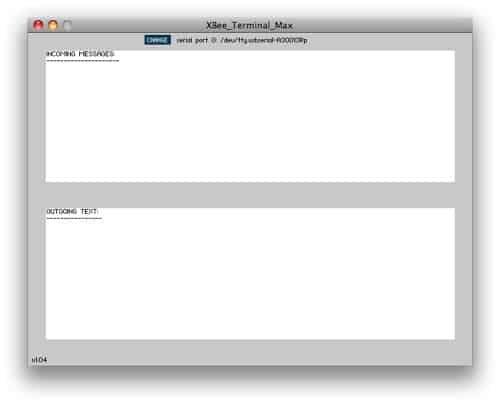 An improved version of the original XBee Terminal for Processing that features a much bigger screen, scrolling text areas, interactive serial port management and helpful reminder messages. You can also download the original source code, in which case you’ll also need the controlP5 GUI library. Thanks to Max Whitney for generating many of the improvements and Tom Igoe for the original code. Oh, and a handy tweak from Usman Haque. I downloaded it in Debian Lenny AMD64. 1) The cursor blinks. This seems to be an old java problem. I have no idea how to fix it; but processing’s cursor doesn’t. 2) The RXTX linking and such seems to have a problem removing the lock file. Is this a permissions problem? possible errors that might occur in this method . e.g. check for casting errors, possible nullpointers, array overflows … . I only have one XBee hooked up, but I wanted to experiment. I would be more than happy to supply any system information including strace output if needed. how do you install this? I’m having a major issue with building the wireless temperature sensor network. the program and xbee’s used to work, but then i used the same usb port for another project (involving arduino). ever since, all i get from the “simple sensor network” sketch is “ “COM3″”… very odd! i’ve tried changing to COM4 which hasnt made a difference. also, it dosent appear to matter which usb port the xbee explorer is plugged into, the same message appears each time (not even the “have you changed line 20…” message). please help! 2 Pings/Trackbacks for "XBee Terminal Max"